Though different organs have been involved in falciparum malaria, pancreas has not been a common organ involved so far. Pancreatitis is a rare complication of Plasmodium falciparum malaria. The patient was admitted with low Glasgow Coma Scale and was febrile and in hypotension, and with oral bleeding. Preliminary investigations revealed leukocytosis, severe anemia, low platelet count, abnormal renal function test, deranged liver enzymes with conjugated hyperbilirubinemia, raised international normalized ratio, and hypoalbuminemia. Arterial blood gas showed metabolic acidosis. The raised pancreatic enzymes with radiological evidence of pancreatitis helped establish the diagnosis. Patient's condition improved with antimalarial, blood transfusion, circulatory support, and hemodialysis. The most possible mechanism of pancreatitis in malaria is microvascular occlusion with resultant ischemia, activation of pancreatic enzymes, and injury to pancreas due to autodigestion. Prognosis was good in our case of malarial pancreatitis. A 26-year-old male from malaria endemic area admitted with chief complaints of high-grade intermittent fever associated with vomiting for 3 days. However, as the patient developed altered sensorium on the 4th day, he was shifted to the intensive care unit (ICU). In the ICU, on detailed clinical examination, the patient was found to having a temperature of 102°F, heart rate 120/min, respiratory rate 26/min, Glasgow Coma Scale (GCS) of E2V2M5, agitated, bleeding from mouth, hypotensive with low blood pressure of 90/56 mmHg, icteric, liver enlarged and palpable 5 cm below the costal line, and spleen enlarged by 4 cm, and abdomen distended and tender. 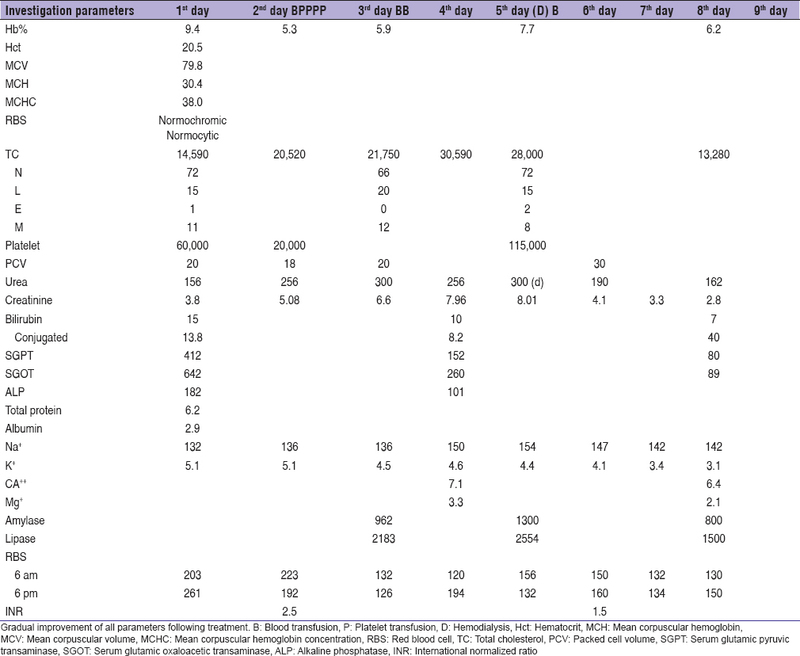 Various investigations done in ICU [Table 1] revealed high white blood cell (WBC) of 20,520/cumm; severe anemia with Hb% of 5.0 g/dl; low platelet count of 20,000; worsening renal function test (RFT) with blood urea of 256 mg/dl and serum creatinine of 5.08 mg/dl; liver enzymes serum glutamate pyruvate transaminase 412, serum glutamic oxaloacetic transaminase 642 with conjugated hyperbilirubinemia of 15 mg/dl, international normalized ratio 2.5, and hypoalbuminemia, amylase 962 u/l, and lipase 2183 u/l. Arterial blood gas showed metabolic acidosis [Table 1]. Histidine-rich protein-2 antigen specific to P. falciparum tested positive, peripheral blood smear for malarial parasite found to be P. falciparum positive, typhoid negative, hepatitis B surface antigen negative, retroviral test negative, urine c/s no growth, blood c/s no growth, ultrasonography of whole abdomen showed gallbladder wall edematous, mild per portal cuffing with moderate hepatosplenomegaly, computed tomography abdomen showed peripancreatic fluid collection with diffusely enlarged pancreas with low density due to edema [Figure 1]. The patient was resuscitated with intravenous (IV) fluids of 3% NaCl and circulatory support of noradrenaline infusion and with Ryles tube aspiration. Treatment continued with IV artesunate 120 mg stat followed by 120 mg after 6 h and 120 mg once daily for 5 days, clindamycin 600 mg thrice daily, piperacillin-tazobactam 2.25 g thrice daily with renal dose adjustment, pantoprazole once daily, ondansetron thrice daily, and sodium bicarbonate for acidosis. According to investigation reports, patient was infused with 2 units of platelets, 2 units of fresh frozen plasma, and 2 units of packed cell. Patient's GCS and hemodynamic status improved with antimalarial and blood transfusion so circulatory support was withdrawn. The patient was kept nil per orally for 2 days, but as the patient's abdominal distension and abdominal pain reduced, he was allowed to resume his normal diet. Patient clinically improved but RFT continued rising with urea 300 and creatinine 8.01. The patient underwent one session of hemodialysis. In spite of deranged RFT, patient's urine output remained high with maximum of up to 7000 ml. After single hemodialysis, GCS improved to 15/15. Gradually, renal function corrected toward near normal with urea 162 mg/dl and creatinine 2.8 mg/dl and WBC-reduced to 13,280/cumm amylase, lipase 800 u/l, and 1500 u/l, respectively. Patient shifted out of emergency ICU to ward on the 9th day. Falciparum malaria is known to cause multisystem involvement and results in severe manifestations. However, pancreatitis is a less described complication of falciparum malaria. In 1907, in a review of 105 cases of pancreatitis, the author could not find one patient of pancreatitis caused by falciparum malaria. Complicated falciparum malaria presented either as cerebral malaria or acute renal failure has higher mortality rate. Patient of malaria with various presentations of fever, ARDS, hemolysis, pain in abdomen, vomiting complicated with pancreatitis with or without multiorgan failure has been reported, but whether it is mere association or an actual causative factor is still to be evaluated. It is proposed to verify the most possible mechanism of pancreatitis in malaria is microvascular occlusion with resultant ischemia, activation of pancreatic enzymes, and injury to pancreas due to autodigestion. If autopsy finding of severe falciparum malaria shows hemorrhage in pancreatic parenchyma and there is no evidence of drug toxicity, obstructive cause, or alcohol abuse, it is reasonable to think that pancreatitis was secondary to malaria. Non-falciparum malaria can also cause acute pancreatitis. Other infections such as dengue can cause pancreatitis. There are several common causes of acute pancreatitis, principally excessive alcohol intake and gallstones, and there are many rare causes. Parasitic hookworm infestation is a very rare cause of pancreatitis.,, Infection is among uncommon causes of acute pancreatitis; hence, this case is important to discuss. Acute pancreatitis due to malaria with abdominal pain should be considered in febrile patients in endemic areas. In addition to antimalarial drug, correction of dehydration, electrolyte imbalance, judicious bowel rest, and prophylactic antibiotic should be administered to patients with malarial pancreatitis., In our case, utmost care had to be taken in fluid management as patient had to undergo dialysis due to renal failure in spite of pancreatitis a situation where adequate hydration is necessary. Pancreatitis, until now was thought to be a rare association of complicated malaria with multiple organ involvement, is gradually increasing in its incidence as reported from various regions of malaria endemic areas. In patients of malaria with or without abdominal pain, pancreatitis should be suspected if the general condition of the patient deteriorates rapidly. Koram KA, Molyneux ME. When is “malaria” malaria? The different burdens of malaria infection, malaria disease, and malaria-like illnesses. Am J Trop Med Hyg 2007;77 (6 Suppl):1-5. Egdagl A. A review of 105 reported cases of acute pancreatitis, with special reference to aetiology: With report of two cases. Johns Hopkins Med J 1907;18:130-2. Gurman G, Schlaeffer F, Alkan M, Heilig I. Adult respiratory distress syndrome and pancreatitis as complications of falciparum malaria. Crit Care Med 1988;16:205-6. Simadibrata M. Acute pancreatitis in dengue hemorrhagic fever. Acta Med Indones 2012;44:57-61. Shmelev A, Abdo A, Sachdev S, Shah U, Kowdley GC, Cunningham SC. 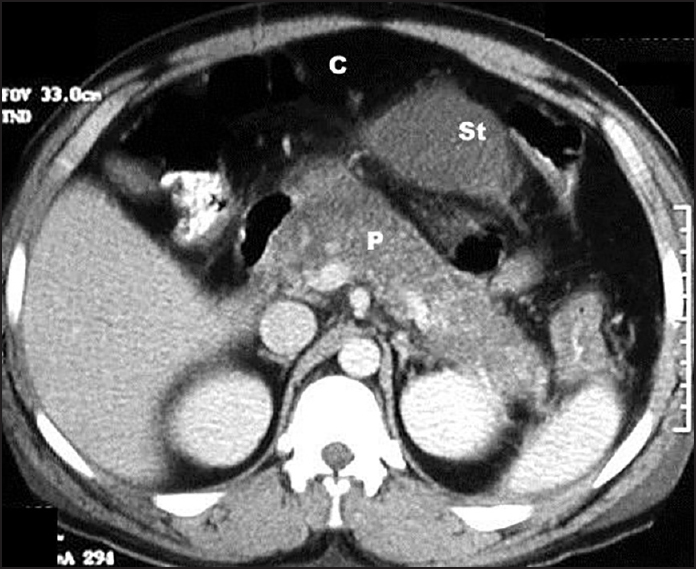 Energetic etiologies of acute pancreatitis: A report of five cases. World J Gastrointest Pathophysiol 2015;6:243-8. Javid G, Zargar S, Shah A, Shoukat A, Iqball A, Gupta A. Etiology and outcome of acute pancreatitis in children in Kashmir (India). An endemic area of hepatobiliary ascariasis. World J Surg 2013;37:1133-40. Tseng LM, Sun CK, Wang TL, Lin AC. Hookworm infestation as unexpected cause of recurrent pancreatitis. Am J Emerg Med 2014;32:1435. Tenner S, Baillie J, DeWitt J, Vege SS; American College of Gastroenterology. American College of Gastroenterology guideline: management of acute pancreatitis. Am J Gastroenterol 2013;108:1400-15. Pasvol G. The treatment of complicated and severe malaria. Br Med Bull 2006;75-76:29-47.